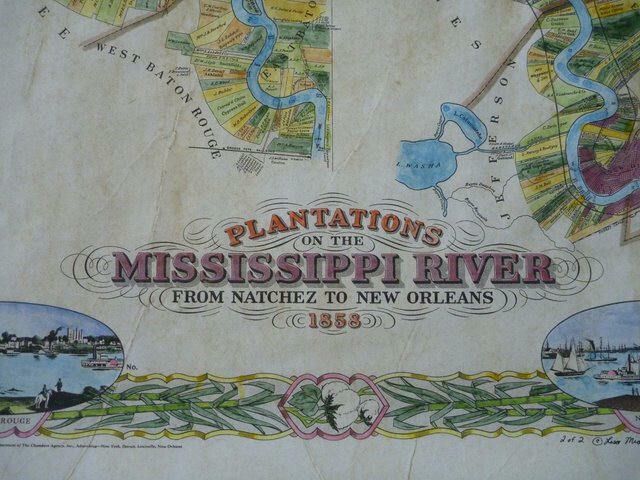 Historic Maps of the Mississippi River, including French, English, Spanish, American and rare RIBBON MAPS Antique Mississippi River Maps by the French, English, Spanish and American Explorers have been reproduced and individually hand painted for this unique collection. Prefer to use GOOGLE CHECKOUT? 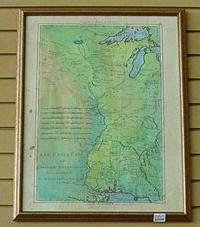 Antiqued Hand Painted Mississippi River Maps make great Gifts for your family River Buff or Traveler! To ORDER any of the maps below, just call us at 888-255-7726! 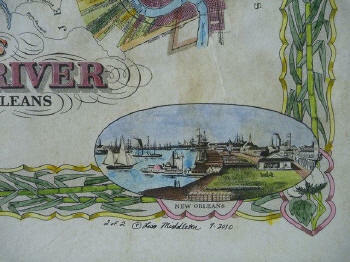 Click here to see our gallery of photographs showing close-ups of historic map details. Then return to order online (below) or give us a call. Click here to "Meet the Artist!" 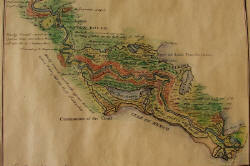 "Absolutely, we thought the hand-painted maps were fabulous. They have terrific impact in our gallery windows!" 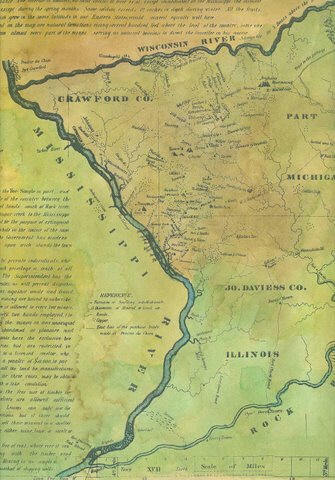 For the first time, we now offer an historic American map that is "off River." 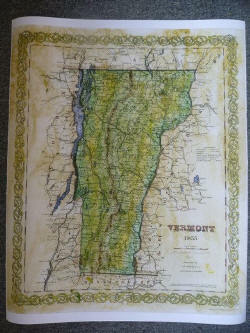 Lake Champlain and the state of VERMONT feature in this beautiful hand-painted historic map. So if you have a family member who hails from Vermont, this one is FOR YOU. 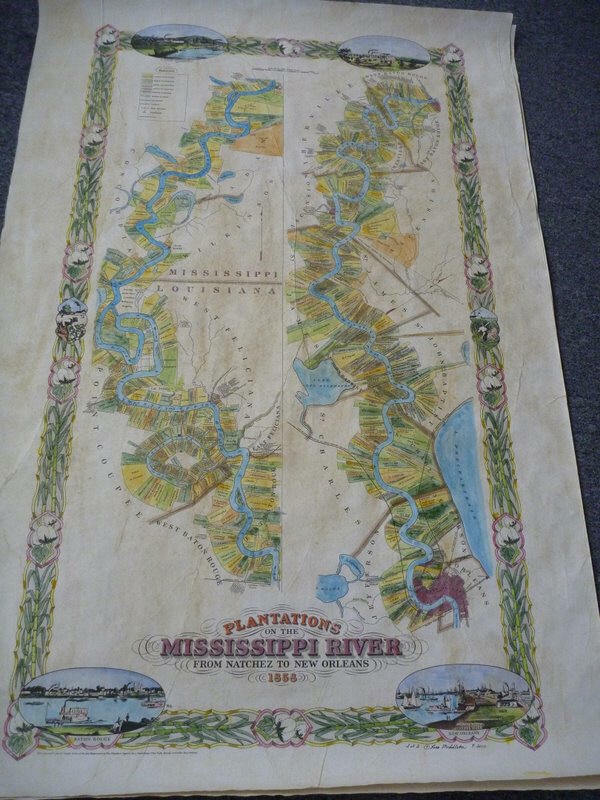 Limited Edition Print 8" x 26"
Limited Edition GIFT Print: Map of the Course of the Mississippi"
Map size 10" x 36"
Includes St. Charles and "Kaokia", New Madrid, Natchez, Baton Rouge and New Orleans, and south to the mouths of the Mississippi. Vicksburg is noted as Fort Nogales or WALNUT HILLS. Lots of notations, such as "swampy land for distance of 2 or 3 leagues." 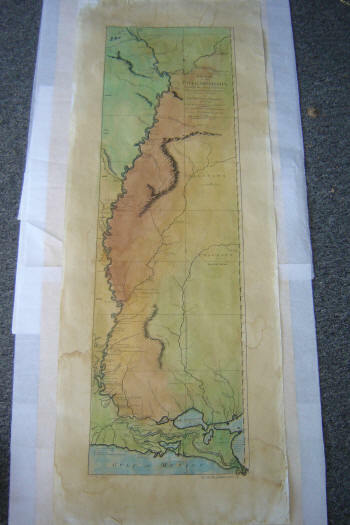 Antiqued, hand-painted reproduction of the PLANTATION MAP, 1858, South from Natchez, Mississippi, including parts of Arkansas, and Louisiana. Individual plantations are clearly labeled. 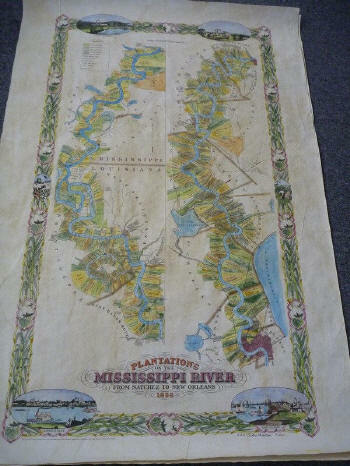 Only NINE proof prints were made of our 2006 Plantation Map Painting. Certificate provided. Portion of the Crawford County Lead Mines bounded by the Wisconsin River to the North and the Mississippi River to the West. Includes Mineral Point, Dodgeville to the East. Reproduction is crystal clear. 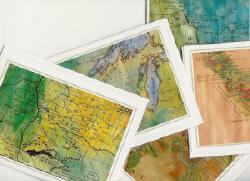 Each ribbon map in this edition is delicately and individually hand-painted in skillfully blended watercolor earth tones. 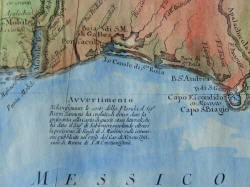 All our hand-painted historic map reproductions can be produced to any size on a commission basis. 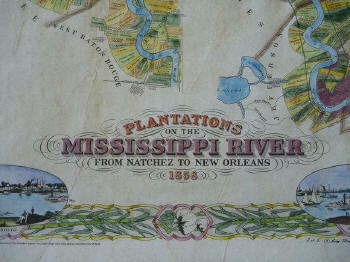 CLICK HERE for detailed historical information on Mississippi River RIBBON MAPS. Par (by) M. BONNE Ingenieur Hydrographe de la Marine. All French, good detail from Lac Superieur to the mouths of the Mississippi. 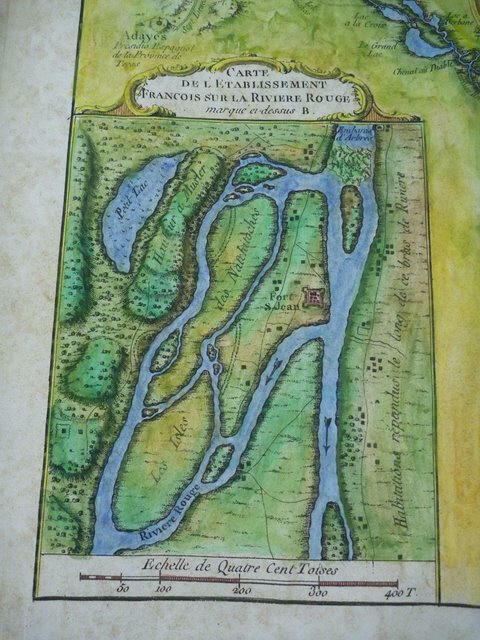 To south, it shows Ft. de la Pointe Coupee, R. Rouge, Ft. des Natches, Ft. St. Pierre and mentions Ft. Rosalie without the usual annotation that the Fort was destroyed (seen in our maps dated 1756 or later). 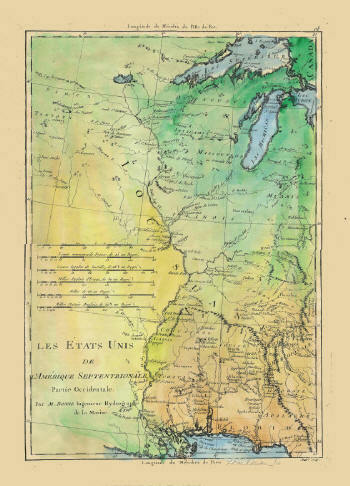 In the north it shows a very large Lac Rouge, Saute St. Antoine (St. Anthony Falls), Fort St. Nicolas near the Ouisconsing (Wisconsin) R. and etc. Good detail on Fort S. Philippe, Cahokias, and several lead mines in the Ste. Genevieve area. Good detail on the Ohio River and it's tributaries. Good detail of the Apalachian Mountains, Georgie, Cherokee country, etc. More detail East of the Mississippi than West (although there is good detail for inland Minnesota). Unlike any other map, it shows the Mississippi going towards inland Minnesota and notes that the source is UNKNOWN. Beautifully Hand Colored Reproduction of the 1698 Italian "GULFO DEL MESSICO"
From the Arkansas River to the Gulf of Mexico (includes the Arkansas Post) and EAST to the northern coast of Florida. This ITALIAN map is one of our most detailed and most beautiful maps. 1757 from the Appalachians to the Rockies, North to St. Paul, the entire Mississippi. 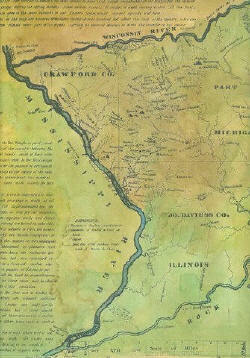 Notes French colonies, Indian nations and towns, Mines, the River St. Louis (Mississippi River) and adjacent rivers. From the "Saute de St. Antoine" (Minneapolis) to the Gulf. Very detailed for much of the Missouri River and western regions. Mouth of the Mississippi is marked as "unknown". 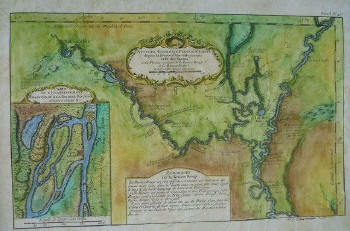 Lieutenant Ross' large scale map of the Mississippi is the largest format map of the Mississippi during the 18th Century, and the most detailed British Military Survey of the River. The map is based upon D'Anville's large map of 1746 and his Carte de la Louisiane published in 1752. Shows Fort Chartes in the north, and Fort Kaskaskia. Adds substantial detail for southern portions of the map, including Pointe Coupee and Fort Rosalie. 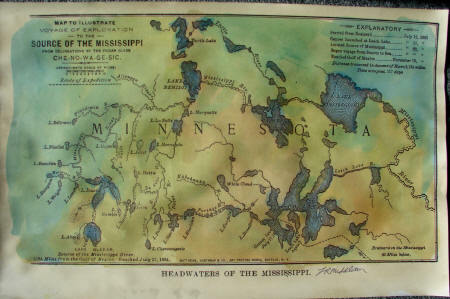 Hand Color-Tinted "Lt. Ross: Map of the Course of the Mississippi"
Original, signed, hand-painted version of this 1887 map is also available. 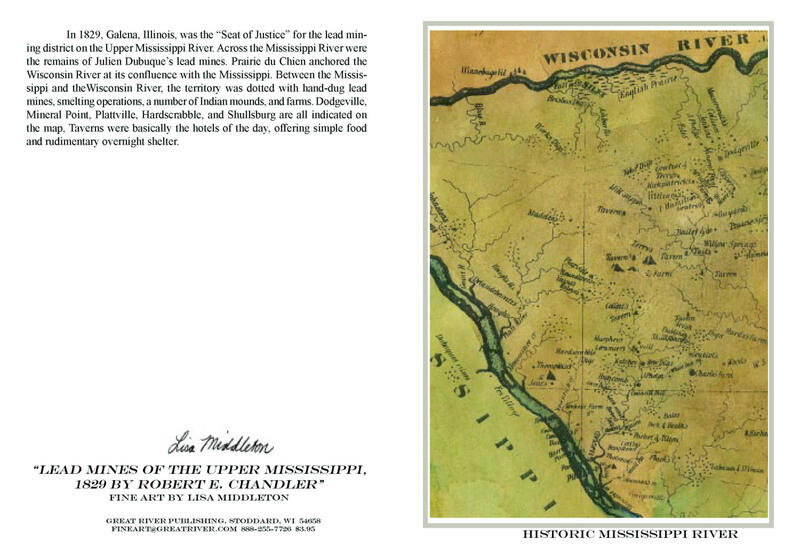 Limited Edition Print of Glazier's HEADWATERS of the Mississippi"
From the Iberville to the Yazoo River. Fort Rosalie (Natchez) is shown. Also Fort de la Pointe Coupee. A portion of the Red River is detailed as well as an inset map of French settlements near the Natchitoches and historic Fort St. Jean. Click link to see details of this map! 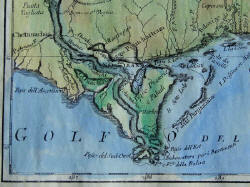 Bellin is one of the most proficient French cartographers of the mid-eighteenth century. Appointed the first "Ingenieur Hydrographe de la Marine." Map size 30 " x 20"
Note on pricing: If you have been visiting this site, you will notice a price increase on all the hand-painted historic map reproductions. As we compete with art galleries to carry the maps, our costs are rising. Additionally, we have upgraded the weight and archival properties of both the hand painted maps and our NEW option of an individually hand-printed ARTIST's PROOF. Yes! We do paint privately owned maps.. we will produce a high resolution scan to the size you require. Phone or email us with your query. We are in the process of adding the rest of our maps to this shopping cart... To ORDER any of the above maps, just call us at 888-255-7726! Meanwhile we recommend to you any of the following great Mississippi River art products! Unique real-photo NOTE CARDS of hand painted antiqued maps. 5x7 size, individually packaged with envelope and clear acetate. Set covers stretches of the entire Mississippi River. Extremely limited edition! Ask us how to put your favorite bit of the river on a custom note card! Framable prints of 20+ historic riverboats. Click photo, left, to see our entire selection of prints. Note which specific boat prints you wish to purchase in the comment box of the online order form when you click the purchase button below..
A Lively History of Steamboating... with a delightful and informative anthology of accounts from steamboat passengers, crews and journalists of the 19th century. Personal accounts of all aspects of steamboat travel from the development and construction of vessels, to steamboat races, accidents and the pleasures of Mississippi & Ohio river travel. If you have enjoyed visiting our award-winning Mississippi River Home Page, consider subscribing TODAY. Voluntary user donations are VITAL to keeping greatriver.com on line! Your subscription entitles you to a unique @GREATRIVER.COM Email Address!! Ideal for river businesses and buffs. Subscribe to greatriver.com... the Mississippi River Home Page! in the south. The Delta Region promises cooler temps, Spring Pilgrimage tours, and less humidity than is seen during the summer. Vol 4 of Discover! 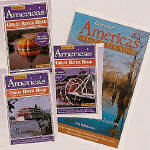 America's Great River Road provides all the insights you need to explore the Mississippi River Delta.